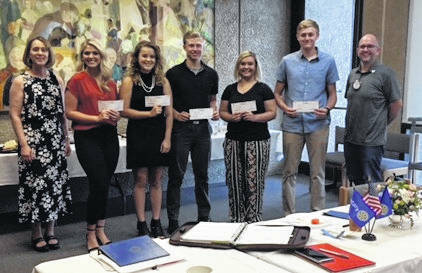 The Gallipolis Rotary Club recently awarded five individual $1,250 scholarships to area high school graduates who have demonstrated their commitment to academic excellence and have been extensively involved in the community. The Gallipolis Rotary Club has awarded annual memorial scholarships since the early 1970s. Pictured left to right are Debbie Saunders, Scholarship Committee Chair; Lauren Ellie Rose, GAHS; Isabella Mershon, RVHS; Matthew Moreaux, GAHS; Alexis Wothe, SGHS, Adam Sickels, GAHS; and A.J. Stack, Vice President, Gallipolis Rotary Club.